Deal of the Day, now in Windsor, with Groupon! This article is 3113 days old. Windsor, you can get a-deal a-day, with Groupon! Whoa, whoa, wait, wait, wait, back up… Groupon? Say what? Groupon, a portmanteau between the words “group” and “coupon”, is a web-based business that sells one LOCAL product per day, for 24 hours to geographic audiences (usually cities). And it’s now in Windsor. The site, which started it’s Windsor page today, networks with local businesses to bring volume discounts to products and services. 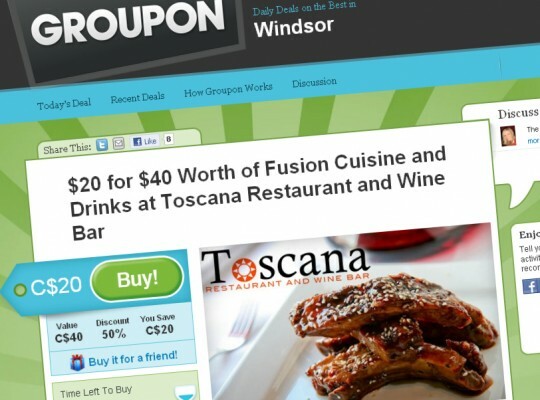 Take for example today’s first deal: a $40 dinner at Toscana (on Dougall) for $20. Groupon relies on people to recognize a good deal and act on it. As of this writing, 74 people have scooped up today’s deal! Looks like a pretty cool site that we’ll definitely keep our eyes on.